Recently I’ve been working with Ella Taylor-Smith and others on two proposals related to collaborative production, which has got me thinking about how systems respond to change. And then today I was listening to a podcast of Johan Rockstrom (Swedish environmentalist) and Ethan Zukerman (American cyber activist) talking on the World Service’s ‘The Forum’ on TED show themed edition of 18 July 2010. Highly efficient systems are vulnerable to minor changes: they are configured to exactly meet the current environment. Rockstrom highlighted that resilience about recognising that change is universal, and that we need to prepare for it. 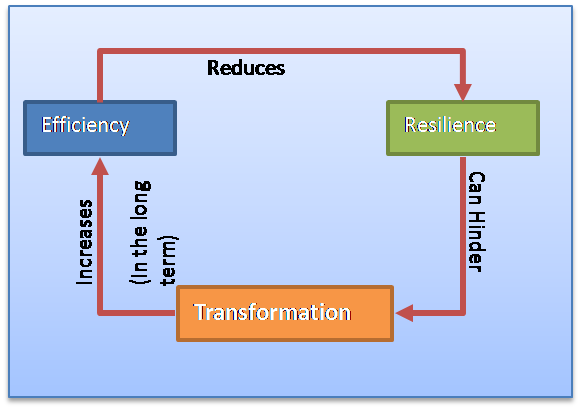 It’s only once the third level of resilience can be reached that it is realistic to expect an existing stable system to change, rather than bending an adapting. Do we need to induce a crisis to make effective change then? Leninist will love that! Final thought: I think it’s reasonable to expect that a collaborative production process would have to be more resilient than its simple bureaucratic equivalent, to allow for change as people learn what they can do, for instance. So perhaps the expected savings might not be as dramatic as David Cameron is clearly hoping. This entry was posted in Methodologies, thoughts and tagged co-production, collaborative production, efficiency, reslience. Bookmark the permalink.